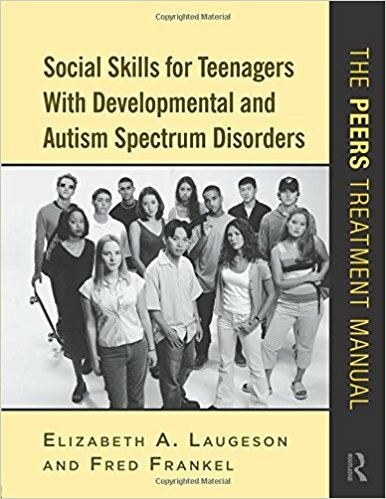 The PEERS Program (Program for the Education and Enrichment of Relational Skills) developed by Dr. Elizabeth Laugeson at the University of California, Los Angeles, is a parent-assisted, social skills intervention for teens with developmental and autism spectrum disorders. This manual covers a variety of social skill strategies including: conversational skills, how to choose friends, how to make jokes and use humour effectively, scheduling social outings, and how to handle social conflicts, teasing, bullying, and gossip. Over 14 sessions, teens will learn the skills to engage in successful social interactions with the support of direct instruction, video modelling, real-world practice, handouts, and homework assignments. The manual also provides advice for adults on how to deliver the lessons, and respond effectively to challenges during sessions. This program is affiliated with the UCLA Semel Institute for Neuroscience and Human Behavior, and is linked with the Friendmaker app. Laugeson, E. & Frankel, F. (2010). Social skills for teenagers with developmental and autism spectrum disorders: the peers treatment manual. New York: Routledge.